Is this the face of the young Moses? The biblical story of Moses and the Exodus is set around 3500 years ago. The precise date, however, was until recently difficult to determine: the Old Testament does not provide dates; neither does it name the reigning Egyptian pharaoh at the time. Now, excavations of the ancient city of Jericho have made it possible to place the Exodus story in an historical context. The Bible says that the Exodus took place forty years before the Israelites conquered Jericho in what is now the West Bank, and archaeologists have revealed that this city was conquered by the Israelites in much the way the Bible relates. The latest carbon dating places this event to around 1315 BC, with a decade margin of error either way. This means, if the Bible is correct, that the Exodus occurred sometime between 1365 and 1345 BC. So is there historical evidence of Moses' existence during this time? The middle coffin used for Tutankhamun's burial. Some Egyptologists believe that Prince Tutmoses returned to Egypt and was eventually buried there. If this is true then he is unlikely to have been the historical Moses who, according to the Old Testament, never returned to Egypt after the Exodus. Tutmoses, though, was never buried in the tomb prepared for him in the Valley of the Kings. The assumption that he died in Egypt is based entirely on the discovery of a number of funerary items bearing his name, which actually means nothing in itself. Funerary good were prepared for the Egyptian royalty years before they died. Egyptian religion required that a royal person’s burial should be extremely elaborate; if it was not done properly then they would suffer in the afterlife. These burials included a great many ritual items that were entombed with the deceased. This all required years of preparation: tombs were dug, and burial goods were made and ready, years before a pharaoh died. Sometimes, however, these items were never used in the burial of the person for whom they were intended: for instance, because an individual was disgraced, overthrown or exiled. It is a little publicised fact, but many of the burial goods in Tutankhamun’s tomb were originally made for others. The reason being, that Tutankhamun died tragically young before all his own funerary items were ready. One of these items was Tutankhamun’s coffin - one that may originally have been made for Prince Tutmoses. The death mask of Tutankhamun (left) and the face on the middle coffin exhibit very different features. When an ancient Egyptian pharaoh was crowned he was given a throne name, in much the same was as the Pope takes a new name when he becomes pontiff. 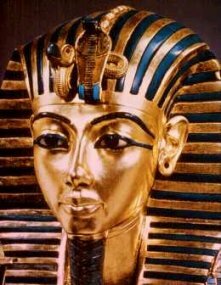 Tutankhamun chose the throne name Neb-kheperu-re – “Lord of [the god] Re’s Manifestations”. This name was found inside the middle coffin, but closer examination revealed that it had been inscribed over an earlier throne name that had been sanded down and polished out. Microscopic analysis has now made it possible for the original name to be discerned: Ankh-kheperu-re - “Living Manifestation of Re”. This was, in fact, the throne name used by Tutankhamun’s immediate predecessor, his older brother Smenkhkare. While he was alive Smenkhkare had persecuted the Egyptian priesthood and, when Tutankhamun died, these priests had no qualms about robbing his tomb to furnish Tutankhamun’s. When Smenkhkare’s tomb was discovered in 1907 it was found to have been robbed of all its burial goods. Only the mummy and a single wooden coffin remained. This had not been the work of the usual grave robbers, however, but had been officially sanctioned by Tutankhamun’s priests who had resealed the tomb with their official seal. When Tutankhamun’s tomb was discovered fifteen years later, so also were many of these missing burial goods. Dozens of Tutankhamun’s funerary items were found to have been inscribed with Smenkhkare’s name. The middle coffin, therefore, has been assumed to be one such item. Egyptian princes often chose, or were given throne names well before they became pharaoh, and the various pieces of Prince Tutmoses’ funerary equipment that have been found show that he also intended to reign with this throne name Ankh-kheperu-re. 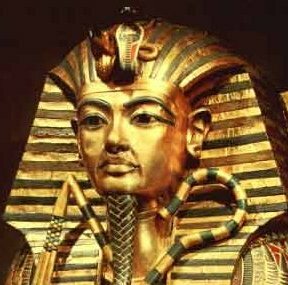 Tutmoses, of course, never became pharaoh and so never used that name, which is why Smenkhkare later used it as his throne name. The middle coffin, therefore, could equally have been made for Prince Tutmoses, rather than Smenkhkare. Certainly, a number of other items in Tutankhamun’s tomb had originally been made for Tutmoses, such as the ivory whip. In the 1990s scientific examination of Smenkhkare’s mummy made it possible to reconstruct his face from the skull. The figure does bear a family resemblance to Tutankhamun, as would be expected. It does not, however, look anything like the figure depicted on the middle coffin. In particular, the face has a much more extended profile to the flatter face on the coffin. If the figure is not Smenkhkare, then it could well be the only other person of the period for whom a coffin would have been inscribed with the throne name Ankh-kheperu-re: Prince Tutmoses – the man who may have been the historical Moses. If it is, then it is the only lifelike representation of Moses ever found. Reconstruction of Smenkhkare's face made in the 1990s shows a very different profile to the figure on the middle coffin. According to the Bible, for many years the ancient Israelites endured slavery in Egypt. One Israelite, Moses, was secretly adopted as a baby by an Egyptian princess, and was raised as a prince at the Egyptian court. When he became a man, Moses’ sympathy for the Israelite plight made him an enemy of the pharaoh, the Egyptian king, who forced him into exile. Many years later, Moses returned to Egypt and led the Israelites to freedom in the events referred to as the Exodus. In the Bible, Moses is raised as the pharaoh’s own son, but after he is exiled and the pharaoh dies, another son, Moses’ step-brother, becomes king. During most of the period in question the ruler of Egypt was the pharaoh Akhenaten. Akhenaten did indeed have an elder brother – Prince Tutmoses - who was heir to the throne, but for some unrecorded reason, like Moses, he was exiled from Egypt before he could become king. Could this Prince Tutmoses have been the historical Moses? Almost no records have survived concerning Prince Tutmoses from which to say anything for certain. His name is certainly interesting, though. The moses in his name is Egyptian for “son”: his name means “Son of [the god] Tut”. (Tut is better known by the Greek rendering of the name, Thoth.) If Prince Tutmoses turned his back on the Egyptian gods as Moses did, then he might well have dropped the Tut element from his name, shortening it simply to Moses. Apart from the moses element in his name, and the fact that he was exiled, there are two other things Prince Tutmoses may have shared in common with Moses. The Bible tells us nothing about Moses’ time as an Egyptian prince, but the first-century Jewish historian Josephus records a number of traditions associated with Moses that still survived during his time, 2000 years ago. One was that Moses had at one time been a commander of the pharaoh’s chariot forces. An ivory whip bearing Prince Tutmoses name was found in Tutankhamun’s tomb; it is inscribed with hieroglyphics revealing that he had at some point been the king’s chariot commander. Josephus also suggests that while he still followed the Egyptian religion Moses had been a priest in the temple in the city of Heliopolis in northern Egypt. Inscriptions discovered in the ruins of the temple of the god Ra in Heliopolis do indeed refer to Prince Tutmoses having spent time there as a high priest. Egyptian mummies of the period were interred in a nest of three coffins, like a set of Russian dolls, one inside the other. Two of the coffins made for Tutankhamun bear his likeness depicted on his famous death mask. The middle coffin, however, bears the image of someone with markedly different features. The lips of the coffin figure are smaller; the face is broader and altogether flatter than the figure depicted on Tutankhamun’s death mask and the other coffins; and the image seems to represent someone in their early to mid twenties, whereas Tutankhamun was only around seventeen when he died. 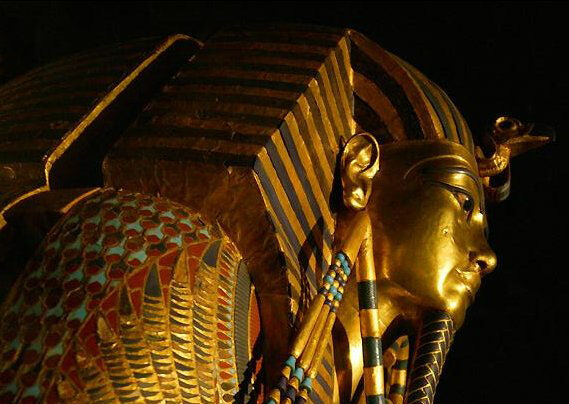 So who was this mysterious figure depicted on Tutankhamun’s coffin? Strangely, although Egyptologists have known for years that Tutankhamun was buried in someone else’s coffin, it is virtually unknown outside academic circles that the famous coffin does not bear Tutankhamun’s image. It is, in fact, one of the images the world has come to recognise as Tutankhamun. It is found reproduced in photographs to promote all manner of Egyptian-related material: posters to publicise books, brochures to advertise Egyptian holidays, and literature to support Egyptian exhibitions. The fact remains, however, that it is not Tutankhamun. But is it really Smenkhkare?